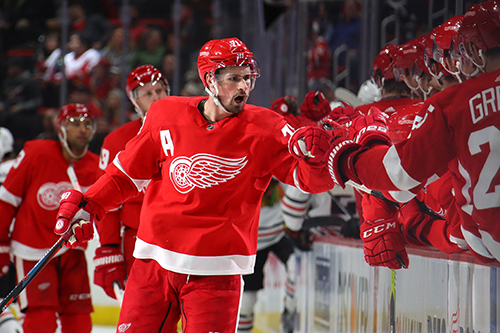 With a number of NHL teams scrambling to secure their playoff positioning on the final day of the NHL regular season, the Detroit Red Wings stood on the outside looking in. Their final game against the Buffalo Sabres was virtually meaningless, other than its impact on their odds in the upcoming draft lottery. At stake was a shot at this year’s top prize, American phenom Jack Hughes, who was honing his craft just down the road from Motown at the USA Hockey Arena in Plymouth, Mich.
It’s not the position any team wants to be in come early April, but it’s where the Winged Wheel franchise found itself for the third straight year in the midst of a rebuilding campaign. It's an unfamiliar place to be for the proud organization that previously had enjoyed an unprecedented run of 25 consecutive playoff appearances. Despite finishing 28th in the overall standings – Detroit will select sixth in the Draft – there were several encouraging signs, highlighted by the play of budding superstar Dylan Larkin. While the Red Wings are implementing a youthful infusion, Larkin has quickly become the leader of a group that is propped up by the talents of Andreas Athanasiou, Anthony Mantha and Tyler Bertuzzi. With Detroit general manager Ken Holland stating that the Red Wings will install a captain by the start of next season, plenty of heads are turning their focus to Larkin as the primer pick to lead the team back to the top. One of Larkin’s biggest supporters is veteran forward Thomas Vanek, who has watched his young teammate mature over the past two season and he believes the Waterford, Mich., native “100 percent” has the leadership qualities needed to move the franchise forward. 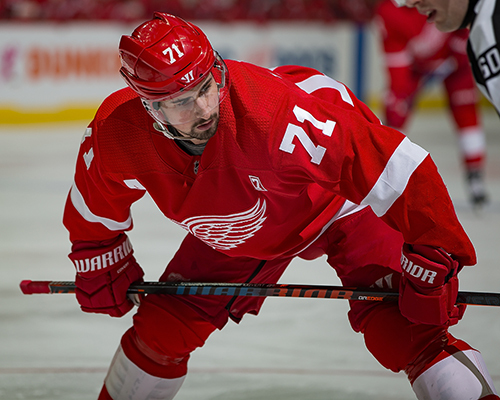 Larkin tends to downplay any talk about him taking on the role, in large part to the veteran voices that still occupy the Hockeytown locker room, including NHL mainstays Niklas Kronwall and Justin Abdelkader. There are certain captains that maintain more of a vocal influence in the room and others that lead by example. Larkin falls into the latter category, but with his inspiring play it’s a positive factor that the other young players can strive to emulate. In only his fourth year in the league, the 22-year-old center has been through the highs and lows of the NHL, from a 45-point rookie campaign that left a lot of observers gawking at his sudden bursts of speed to a 32-point sophomore campaign that had others calling him a bust. After recollecting himself, Larkin put together a team-leading 63 points last season, which led to new a five-year deal with Detroit this past summer. Teammates have been quick to praise Larkin's commitment to bettering himself both on and off the ice, leading to his ascent as a superstar for the storied franchise. Larkin lead the team in goals with 32 and in points with 73, which were both career highs. Sometimes it can take a few seasons for players to recognize what it takes to be consistently on their game every night. Fellow American Jake Guentzel notched a 40-goal season for the Pittsburgh Penguins, playing in all 82 games after reshaping his diet and off-ice habits. Larkin too has committed to that lifestyle on and off the ice, seeking to get his team back into the Stanley Cup Playoffs. And he’s willing to do whatever it takes to get there. “You just learn the game and learn how to prepare for a long season,” said Larkin, who had one goal in his lone playoff appearance against the Tampa Bay Lightning in his rookie season. One thing that Larkin has been truly consistent at is representing the United States on the international stage. A product of USA Hockey’s National Team Development Program, Larkin played in the 2015 World Junior Championship, and has skated for the U.S. Men’s National Team at the past four IIHF World Championships. He’s played a prominent role too, scoring at least nine points in his last three tournaments, including being an alternate captain in the previous two renditions. 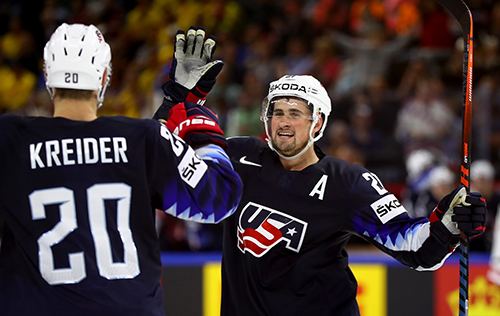 Chris Kreider has already signed on to represent the U.S. in Slovakia in May. Will Larkin, who wore the "A" and contributed three goals and six assists in ten games last year come as well? Just like he’s poised to do with his hometown club in Detroit, as their youthful boost continues, Larkin looks forward to that next step both in his personal play and in helping the team next season. He’ll be the first to call this season “unacceptable.” Born and raised during the Red Wings heyday, Larkin knows that anything less than playing deep into the spring doesn’t cut it in Motown. That’s why he’ll continue to keep pushing to be better and serving as the face of a youth movement determined to return this proud franchise back to the top.